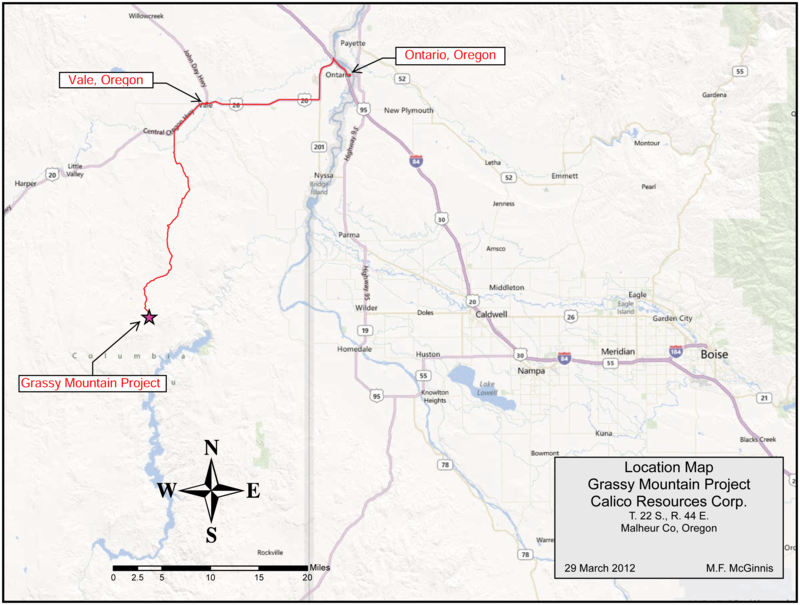 The Grassy Mountain Gold Project is located in Malheur County, Oregon, approximately 22 miles south of Vale, Oregon, and roughly 70 miles west of Boise, Idaho. The project site is situated in the rolling hills of the high desert region of the far western Snake River Plain and consists of 3 patented (private) lode claims where the deposit is located, 462 unpatented lode claims, 9 mill site claims, 6 associated placer claims, and various leased fee land surface and surface/mineral rights, all totaling about 9,530 acres. The local terrain is gentle to moderate, with elevations ranging from 3,300 to 4,300 ft. above mean sea level. Paramount owns 100% of the private land in which the gold deposit sits and controls all mining claims within the 9,530 acre land package. On May 24, 2018 Paramount announced the results of a positive PFS for its proposed underground mining operation at Grassy. •	Pay back of 2.5 years from the start of production. Paramount is now focused on the remaining steps of the permitting process for Grassy Mountain. “The PFS is an important piece in the permit approval process. This process is well advanced and has been marked by a transparent regulatory environment and a receptive, positive response from the Oregon state government. Having proved the basic concept of a profitable underground mine at Grassy Mountain, we will now work on optimizing the PFS and expanding our resource base with targeted exploration,” said Van Treek. 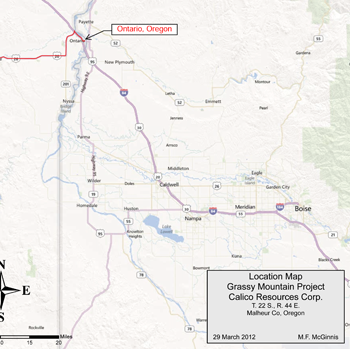 Paramount plans to submit a Consolidated Mining Permit Application with the Oregon Department of Geology and Mineral Industries (“DOGAMI”) in the first half of 2018 and to provide the remaining information required by the Bureau of Land Management (“BLM”) to continue with the federal Environmental Impact Statement (“EIS”) in accordance with the Plan of Operation (“POO”) filed by Paramount in September 2017. Paramount is currently in the process of completing all studies for baseline reporting to submit and be approved by State agencies. All of these reports will be included as part of the Consolidated Permit Application. There are 23 baseline reports in total, and as of November 30, 2018 Paramount has received approval and acceptance for 14 of these reports. There are 4 reports pending approval from State agencies and 4 reports currently being prepared by Paramount for submission. The final report, the mined land reclamation baseline report, will be filed as part of the Consolidated Permit Application. •	Wally/Wood is located approximately one mile north-northwest of the main deposit. Sinter has been seen on surface and previous shallow drilling has intersected up to 90 ft. grading 0.025 opt gold (0.71 g/t). In addition, this area has a well-defined resistivity anomaly which is similar to the anomaly identified at the Grassy deposit. •	Bluegrass is another high priority target as previous shallow drilling has had positive results including 24 meters of 1.1 g/t Au. Finally, Paramount will work on a number of initiatives which could further optimize the new PFS. For example, the study assumes all new equipment but suitable, high quality used equipment could likely be purchased in the western U.S at a significant saving. This web site uses the terms “measured and indicated resources”, “inferred resources” and “proven and probable reserves”. We advise U.S. investors that while these terms are defined in, and permitted by, Canadian regulations, these terms are not defined terms under SEC Industry Guide 7 and not normally permitted to be used in reports and registration statements filed with the SEC. “Inferred resources” have a great amount of uncertainty as to their existence, and great uncertainty as to their economic and legal feasibility. It cannot be assumed that all or any part of an inferred mineral resource will ever be upgraded to a higher category. Under Canadian rules, estimates of inferred mineral resources may not form the basis of a feasibility study or pre-feasibility studies, except in rare cases. The SEC normally only permits issuers to report mineralization that does not constitute SEC Industry Guide 7 compliant “reserves”, as in-place tonnage and grade without reference to unit measures. U.S. investors are cautioned not to assume that any part or all of mineral deposits in this category will ever be converted into reserves. U.S. investors are cautioned not to assume that any part or all of an inferred resource exists or is economically or legally mineable. Under SEC Industry Guide 7 standards, a “final” or “bankable” feasibility study is required to report reserves, the three-year historical average price is used in any reserve or cash flow analysis to designate reserves and the primary environmental analysis or report must be filed with the appropriate governmental authority.